The Indian River Lagoon was originally named the Rio De Ais by early Spanish Explorers due to the large numbers of Ais Indians living along its shores. While often referred to as the "Indian River", in reality it is not a river at all. Instead it is an estuarine lagoon formed by the formation of the barrier island complex to the east about 7,000 years ago. The entire system actually encompasses three major water bodies, the Indian River Lagoon, the Banana River (again not actually a river). and the Mosquito Lagoon, and stretches 156 miles along Florida's east coast from Ponce De Leon inlet in Volusia County to the north to Jupiter Inlet in Palm Beach County to the south. In between there are three additional inlets, Sebastain Inlet at the border of Brevard and Indian River Counties, Fort Pierce Inlet in St. Lucie County, and St. Lucie Inlet in Martin County. There are also many freshwater tributaries to the lagoon and due to the variances in salinity as well as the fact the the northern portion of the lagoon is located in a temperate climatic zone while the southern portion is subtropical, the lagoon has the highest biodiversity of any estuarine ecosystem in North America, including over 700 fish species. 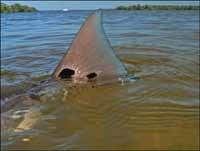 For this reason the Indian River Lagoon system is one of the top fisheries in the country. Below we will discuss the primary habitats of the lagoon and their importance to fishing success. 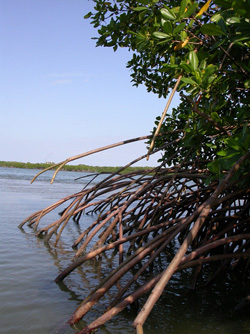 Seagrass Flats; The average depth of the Indian River Lagoon is about four feet and historically, seagrass flats covered almost the entire bottom. While stormwater pollutants from development have significantly reduced the abundance of seagrasses they still remain one the most important vegetation communities in the lagoon. 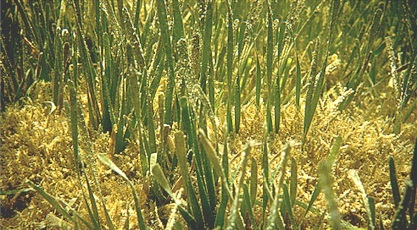 Seagrasses, unlike algae, are vascular plants related to terrestrial grasses that evolved into their present state as water levels rose after the last ice age and today form the basis of the food chain of the lagoon. Shrimp, crabs and many other invertebrates use the seagrass beds as a nursery area as well as cover from predators as do juvenile fishes of many species. In addition, mullet, a primary food source for many gamefish species, feed on the algae that form on the blades of the seagrasses and in turn help to fuel the entire ecosystem. As such the seagrass beds offer some of the most productive and exciting fishing opportunities in the lagoon system, particularly during the summer baitfish season when reds, seatrout, snook, tarpon, and other species are chasing the schools of juvenile finger mullet that crowd the flats each summer through fall. Salt Marshes are an extremely important component of the lagoon habitat, serving as both a nursery for juvenile gamefish and a major producer of forage for larger gamefish. 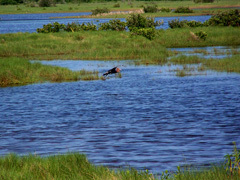 While the extreme shallow depths of the water typically excludes larger fish from hunting directly among the salt marsh grasses they will prowl the shallow flats along the outer edges. Also in areas near inlets where there is a greater tidal influence high tides can be a good time to explore these areas as well as adjacent grass flats when the tides are going out, washing baitfish and shrimps into waters deep enough for gamefish to hunt. 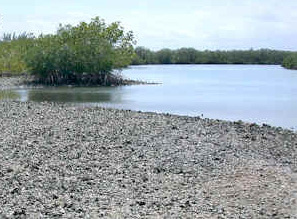 Oyster Flats can be found in some parts of the lagoon system, particularly in the Northern Reaches of Mosquito Lagoon around Oak Hill and can be great fishing habitats. While Black Drum may feed on the oysters themselves, many other species of gamefish such as redfish seatrout snook tarpon and sheepshead seek out the many species of crabs, shrimp, barnacles, flatworms on other small creatures that make their homes within the crevasses of an oyster reef. The Indian River Lagoon within the Space Coast area offers a diverse selection of gamefish to try for with a variety of baits and lures being effective. Different species will require different techniques and baits. The list below is divided into two groups, Pelagic Feeders and Bottom Feeders. Pelagic Feeders feed throughout the water column but place a greater emphasis on the middle and upper levels and will take both live shrimp and baitfish such as finger mullet, glass minnows and other schooling species. They can be caught on a variety of lures including topwater and subsurface plugs, spoons, jighead lures, both feather or bucktail and soft plastic types. Seatrout are one of the four most popular gamefish along the Space Coast, reaching a maximum size of about 20 pounds although the average will be much smaller, about 2 lbs. They will hit live shrimp, finger mullet, pigfish, and many other baitfish species. Early morning topwater plugs cast over shallow grassflats can bring explosive strikes from larger trout. On deeper flats of about 2-4 feet in depth, other lures such as spoons, plastic and bucktail jigs, and subsurface plugs like the suspending mirrolure series can also produce. During the summer, school size trout from 10 to about 15 inches can be caught near schools of glass minnows and found congregating on 2-4- foot flats and often around docks and other structures. Trout can also be caught around mangrove lined shorelines in canals and other deeper areas. During the coldest months of the year large groups will tend to congregate in deeper holes and canals connected to the lagoon when baits must be worked deep and slow in order to entice a hit. Good eating though catch and released is encouraged. Closed seasons and slot limits apply, click here for current fishing regulations. Florida is divided into three management zones for seatrout. 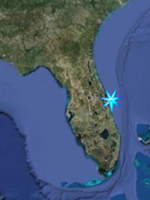 For reference, the Space Coast is in the Southern Region. Snook are another member of the 'Big Four" along the Space Coast. Primarily ambush predators they will hug mangrove shorelines along the lagoons, in canals, at the mouth of creeks, under docks and along rocks and oyster bars. For live bait use jumbo live shrimp, finger mullet, or pigfish. They can be very finicky, especially under heavy fishing pressure. Best times are at dawn or dusk and can be caught readily at night around lit docks. I have personally been fishing at Sebastian Inlet during the day when no one was getting a hit, put on snorkeling gear and found large schools of snook along the bottom of the inlet just ignoring every offering. Then after dark with an outgoing tide they are attacking everything. Always use a fluorocarbon leader when targeting snook as they have an abrasive mouth as well as razor sharp gill plates that can also cut your hand if improperly handled (been there, done that). Strong fighters when hooked and will often jump. They can reach about 50 pounds with the average being 5 or 6 pounds. Snook are a subtropical to tropical species and cannot tolerate cold water so the best fishing will be summer and fall. Great on the table! Closed seasons (Catch and Release) and slot limits apply. A "Snook Tag" must be purchased to keep one. Click here for current fishing regulations. Tarpon are the largest of the big four as well as the largest species of Herring in the world, able to grow over 200 pounds. Along the Space Coast they seem to get up to about 75 to 100 pounds with the average being anywhere from 5 to 20. In some side creeks if you pay attention you can occasionally find 8 to 12 inch juveniles which can be great fun on ultralight tackle. When hooked they will put on an aerial display you will never forget. They will attack topwater and subsurface plugs, spoons, jigs, and soft baits. Shrimp, mullet, and other live baits also work. They will take dead fish off of the bottom. These fish have very tough mouths to set a hook in and do require the use of a fluorocarbon leader. Not much food value but a "Tarpon Tag" is required if you want to keep one for mounting. Click here for current fishing regulations. Jack Crevalle are powerful, fast, and voracious feeders when found around schools of glass minnows during the summer months. Hook one of any size to it on light tackle and you are in for a fight. The average size in the lagoon is about 2 lbs but can get up to about 50 pounds as adults offshore. Use a shock leader to protect against cutoffs. Not much food value and the catch is not regulated. Ladyfish are like a poor man's tarpon as immediately upon being hooked will take to the air. In fact, both fish are in the same family of Elipodae. They feed primarily on small fish but will take a live shrimp Largely nocturnal, can be found attacking glass minnows and other tiny schooling fish in large numbers at which time they will hit almost any lure thrown their way. Ladyfish can reach 15 pounds but most will be under 3 pounds. In the lagoon the average size is about 1 pounds and fish caught there will be juveniles who will move to the ocean to live before reaching sexual maturity. Not much food value and the catch is not regulated. Mangrove Snapper are also known as Gray Snapper and can be found in the lagoon around rocky shorelines, under docks, in mangrove creeks and also out over the grass flats. Inshore they are usually much less than 10 lbs as the adults tend to congregate on offshore reefs. They can be caught on jigs, spoons and smaller rapala type plugs as well as live shrimp. Good eating and limits do apply. Click here for current fishing regulations. Black Drum can grow to a maximum size of 110 lbs but the average in the lagoon is about 10 lbs. They normally feed on shrimp, crabs, clams and oysters, crunching the later two with rows of rounded teeth and powerful jaws. Those targeting larger drum should fish with fairly stout tackle in the 20 to 50 lb. test range and use an adult blue crab with the top shell removed and then cut in half or a quarter to fit a 4/0 to 9/0 size hook on or near the bottom in a channel, and wait. They can also be caught aground bridge pilings, oyster bars and both submerged structure. Then again they can sometimes be seen "tailing" over shallow sand or mud flats as they dig in the substrate for clams and other foods. Drum can be good eating but the quality drops off once the fish grows beyond about 5 pounds. Size and bag limits apply. Click here for current fishing regulations. Pompano are another fish normally targeted in the surf but can be caught in the lagoon on sandy flats on pompano jigs and other types of jigs and grubs. Later in the summer they will congregate near bridges and piers as they gather for the exodus offshore for spawning. Maximum size is about 8 lbs with their average being about 1 1/2 to 2 lbs. Great eating and size and bag limits apply.Click here for current fishing regulations. Atlantic Croaker are a small relative to the Black Drum and can be caught on the bottom using cut shrimp, clams, and sand fleas on a size 2 hook. Jigs tipped with cut shrimp will also work. The average size is under a pound with the maximum being about 3-4 pounds. They are good eating and are not regulated. Sheepshead can be seen cruising the flats but are really more suited for life among rocks, pilings, oyster reefs and other hard surface structures. They have small mouths with teeth that look almost human and small hooks are best when targeting them. They commonly eat small crabs, barnacles, small bivalves and other creatures found attached to structure. Fishing with live fiddler crabs as bait next to bridge pilings is a very effective way of landing them. Mole crabs (sand fleas) and shrimp, (either live or fresh cut) however, are other effective baits. If targeting them off of a bridge or pier it is best to use tackle of at least 12 to 20 lb. test, stand to one side of the piling, not directly over and drop a line next to the piling with enough weight to get the bait to the bottom and be ready to pull them away from the piling after hookup as they can quickly wrap the line around the piling. The bite will be fairly soft and they are experts at stealing bait off of a hook. Good eating and size and bag limits apply. Click here for current fishing regulations..
Whiting are yet another fish normally associated with surf fishing but also can be caught in the lagoon. They feed on a variety of small invertebrates and can be caught on cut shrimp, clams, mole crabs (sand fleas) and jigs tipped with shrimp. They are good eating and are non-regulated. Flats Fishing is by far the most popular style of fishing along the Space Coast with seatrout and redfish being the two most popular species sought, and for good reason, it is a combination of fishing and hunting and when a gator seatrout or big redfish strikes a topwater "walk the dog" type lure like a Mirrolure Top Pup or a Mirromullet, it is the most exciting fishing there is. Especially when you see the fish before you cast or you see a hump of water approaching the lure during the retrieve. the main thing to remember when fishing the flats is QUIET! Be very quiet. Fish in shallow water are skittish because they do feel exposed and will leave an area or quit feeding if it becomes obvious to them that they are being targeted. Flats fishing can be done from a shallow draft boat, a canoe or kayak, from the shoreline but your coverage are will be limited, or by wading. If wading be sure to shuffle your feet along the bottom to avoid accidently stepping on a stingray. The best flats to fish are those where the seagrasses have been able to thrive over the years. In many areas near major towns and cities the grass coverage on the flats has been greatly reduced by stormwater runoff and been replaced brown algaes. There are usually some fish in the area and they can be caught off of city docks and seawalls but areas where the shoreline development has been minimal, non existant or done so with proper stormwater facilities and shoreline vegetation preservation requirements present will usually have more intact seagrass beds nearby and provide better fishing opportunties. Examples of these areas would be the waters surrounding the Merritt Island National Wildlife Refuge, the Thousand Islands area of Cocoa Beach in the Banana River and the south area of the Space Coast near Sebastain Inlet. Most of the grasses seem to be concentrated along the eastern shorlines in all three major bodies of water within the lagoon system. Flats that are adjacient to deeper channels seem to provide the best fishing. Potholes; On healthy grass flats in the lagoon you will find open sandy areas locally called "potholes". In warmer weather, seatrout will often take up ambush sites along the edge of these potholes waiting for any small baitfish that venture over the open water above the potholes. By artificial lures or natural baits through these areas you can often score some great action. 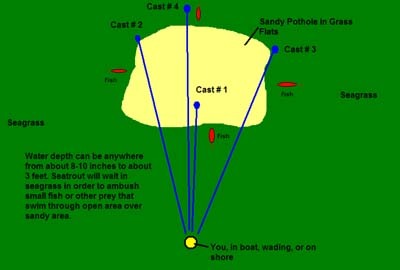 The diagram at left shows a good way of working a larger pothole by strategically placing your casts so that you do not spook other trout that may be working the edges of the area. After a siginificant cold spell in winter, the potholes serve a different function for the fish. On a sunny day after a cold night the sandy bottom will serve as a solar collecter, warming the water over the pothole as the sun rises in the sky. The trout and other species will be directly over the pothole soaking up the extra warmth. So while searching the grass flats for trout and other fish during any time of the year, don't ignore the potholes. While site fishing the flats is certainly the most exciting way to fish the flats it is not the only way and can be very difficult under poor lighting conditions or of there is a light chop to the water, especially if gator seatrout are on the agenda. A gator seatrout is any trout over 7 lbs. and is most likely female. They don't school like younger trout or redfish and unlike redfish which will tend to move around browsing the bottom for food or chasing mullet, gator trout are ambush predators, taking up station, remaining motionless and waiting for a small fish to swim into ambush range. They are not going to be chasing fish or lures all over the flats. Another reason is that these trout are most active at dawn or dusk, meaning much less light to work with. They are also very very wary, having survived a minimum of six years living in a marine environment with dolphins, larger fish, birds, sharks, and other predators wishing to make a meal of them. To blind cast for possibly the largest trout of the day, cast as far from your position as possible with topwater plugs like the Mirromullet and work the area in a fanning pattern. It is slow and tedious but it does work. 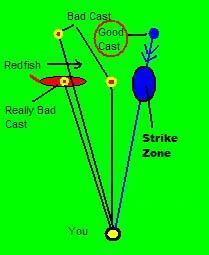 Random casting is basically a crapshoot for every cast you make as you may cast just outside of a trout's ambush range on one cast and cast completely away from it the next, never realizing how close you were. Canals can be great places to fish, especially if they are deeper than the adjacient lagoon waters and lined by mangrove trees. Trout, snapper, snook and many of the other species either set up ambush points or prowl along the mangrove roots looking for prey among the many species of small fish and invertibrates that take up refuge among the prop roots. After a series of cold spells in the winter, trout especially can will congregate in the deeper waters of the canal. You must remember that the fish will be more sluggish during the colder times and very slow to bite. Use you soft jigs and other deep water baits and work them very slowly along the bottom. 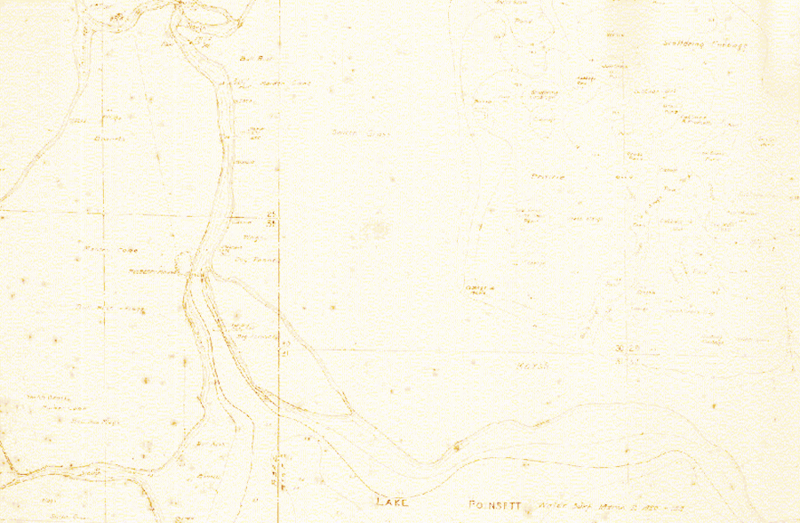 Spoil Islands; Years ago, the Army Corp of Engineers dredged a channel the length of the Indian River lagoon to create the Intracoastal Waterway, an inland shipping channel extending from Texas around Florida and northward to New Jersey. A by-product of this dredging can be seen today along the lagoon in the form of "spoil islands" where the sand dredged to deepen the channel was dumped alongside the channel. Today many of them still exist and have become ecosystems supporting numerous bird, animal, and plant species. And they can be a great place to fish for a variety of species. Some of them are no longer visible above the waterline except that dead trees can be seen above the surface. Great fishing can be found around many of them as they are usually close to deep water, yet over the years they have formed sandbars, flats, coves, and other structure that can attract a great variety of fish. Obviously islands that have eroded below the water surface may be hard to see while in a boat, so a little homework on Google Maps (www.google.com/maps) can be an invaluable tool. 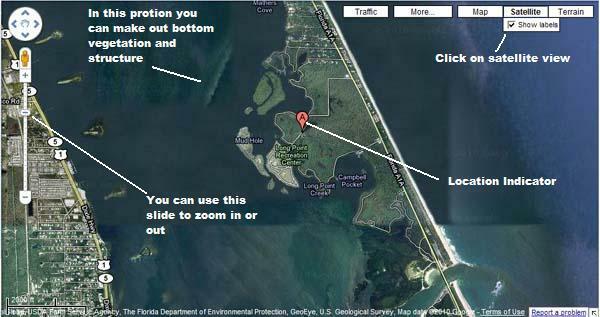 Open the website, use your mouse to zoom in on the lagoon area you will be fishing, click on the "satellite view" and you can plainly see most of the submerged islands in the lagoon to pinpoint their position while in most cases be able to see sandbars, cuts, etc. Above left is a view of submerged spoil islands along the Intracoastal Waterway off of Titusville. Abandoned or neglected docks; Along the shores of the lagoon you will find many docks that have fallen into various stages of neglect. Those that are no longer useable or are just not used often can be great fishing hotspots by offerring great hiding places for wary gamefish to hide as well as cover for bait species. Seatrout and snook especially will take up residence under these structures. When approching these docks do not just motor within casting range and start firing away. 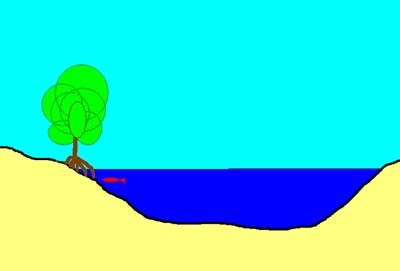 You will put the fish out of feeding mode in a heartbeat. If possible, pole or drift within casting distance and try to put your lures and baits as close to the dock as possible. The best is actually landing your bait slightly underneath the dock. This can be done slightly later in the day after an early morning of fishing the flats. These docks are also great places to try for sheepshead, snapper, drum and other species. After hitting the search button you will come to a map showing the location of the park. If not already set, click on "Satellite" view and it changes from map mode to Landsat satellite imagery. then you can zoom in on a particular area by double clicking on the spot you want to zoom in on. You can back out using the slidebar at the left. Depending on the water clarity at the time the image was made you will be able to see bottom structure and areas covered by aquatic vegetation, as well as deeper holes sandbars, cuts and channels, etc, as demonstrated by this image of Dummits Cove on Merritt Island National Wildlife Refuge. You can also get there by just opening the website and double clicking on the part of the country you want to see, then using the mouse to drag the image around to explore the area. In this way you can actually explore an area you have never fished before and have a little more knowlege about the area when you do go.